Epson’s NEW T3 SCARA Robots offer quicker setup and lower running costs for accelerated automation of simple material handling tasks. The new Epson T-Series is the introductory model in a comprehensive SCARA product range – ideal for simple pick-and-place applications and in areas where linear systems were previously used. At around $7,500 USD, you get a powerful 4-axis robot with integrated controller and diverse connection possibilities, e.g. PROFIBUS and ProfiNET. It also supports image processing, integration of external software and the option to design a custom user interface. The EPSON RC700 robot controller is the next generation high performance controller line with both power, open architecture and industry leading ease of use. More than just a connection to a PC, the RC700 integrates both the power of PC based controls with the with the power of a real time engine running the up to 32 tasks and the SPEL+ language. A single RC700 can be used in a wide variety of systems, from simple single-robot uses to complex multiple-manipulator systems.Capable of controlling up to 6 axis robots, the RC700 provides superior PowerDrive servo control for super smooth motion, fast accel/decel times, and fast cycle times. Epson RS zero-footprint robots utilize the entire workspace underneath the arm. As a result, there is no lost space in the center of the work envelope. No other robot vendor offers a 350mm SCARA arm which can work on pallets as large as 494mm x 494mm. A pallet size this large would normally require a SCARA arm which is almost double the size. With the ceiling mount design and the 100% workspace utilization, RS-Series robots are a great alternative to cartesian, gantry and typical SCARA robots because they literally have a zero footprint – saving you valuable floor space. These robots maneuver under themselves for the shortest movements possible, delivering superior cycle rates. Our LS-Series robots start at the unbelievable price of under $12,000 yet they provide the same EPSON quality, reliability, ease of use and now also expandability as our high performance G-Series robots. With this low price and the high reliability and capability of EPSON Robots, even more applications than ever before are now perfect candidates for EPSON Robot Automation solutions. 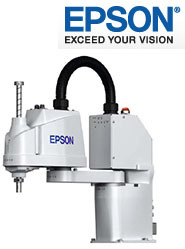 Introducing the new Epson C4 and C4L compact 6-Axis robots. With faster speeds and more payload capability while keeping the SlimLine design, Epson C4 and C4L robots provide superior performance for even the most demanding and complex applications. The new C4 arms extend the capabilities of the C3 by adding more speed and payload while maintaining the unique SlimLine design. Look no further for your next SCARA robot as EPSON gives you more power of choice than ever before. With 200+ models available in sizes from 175-1,000mm in reach and payloads up to 20kg, chances are that EPSON has the model and configuration you need for your next application. The new EPSON C3-V 6-Axis Robots provide resistance to Vaporized Hydrogen Peroxide (VHP®) Gas, an aggressive chemical used in aseptic manufacturing environments. Manufacturers who would normally explore the option of low cost Cartesian type linear axes robots for automation are now able to consider the use of LS-Series SCARA robots as an affordable and high performance alternative. This new robot series is available in arm lengths of 400mm (LS3) and now 600mm (LS6). Epson performance and compact design at an attractive price, the new LS series is designed to make light of heavy manual work. By introducing the LS series, users can now maintain high-efficiency assembly, transfer, alignment, and placement operations, reduce personnelrequirements, and achieve consistent quality.